I opened two Google Chrome windows (because I am using multiple Gmails) and when I do the Cmd ⌘ Tab ⇥ shortcut it just shows me other applications that I opened but does not show me the other Chrome windows that are already opened. How to switch to the other Google Chrome window that I opened using keyboard shortcut? Cmd ⌘ Shift ⇧ ` to go the other way. Note: This only works if all windows are in the same Space, not if they are spread over multiple Spaces, which includes fullscreen. To overcome this, use Cmd ⌘Tab as usual and on the icon of the application you want to switch windows in press the down arrow key (with Cmd ⌘ still pressed). Then use left/right keys to navigate to the desired window across spaces and desktops. You can also achieve this by clicking the app's icon in the Dock - this method will also switch to fullscreen windows, which the other methods will not..
BTW, specifically in Chrome & Safari, but no other app I know of on Mac, Cmd ⌘ (number) will select individual tabs on the frontmost window. It also would appear that Cmd ⌘ ` is yet another of those language-specific shortcuts; so if anyone finds any more variants, please specify for which language & keyboard type. If anybody finds new combos for different languages, please check Keyboard layout here - Apple KB: How to identify keyboard localizations - & add that as well as which Input Source you use in System Prefs > Keyboard > Input Sources. Add a keyboard picture from the KB page too, if that would help. That will make it easier for future Googlers. ` is the key on top of Tab key, so it's similar to Command ⌘ Tab shortcut. 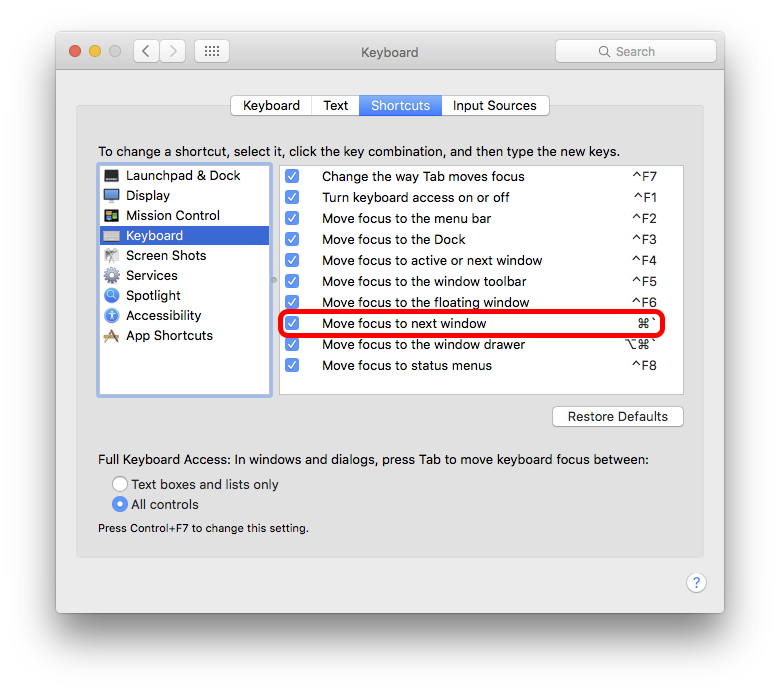 Go to System Preferences -> Keyboard -> Shortcuts -> on the left menu, select Keyboard -> on the right menu, select Move focus to next window. You can now change the shortcut to which ever key is on top of Tab in your keyboard to work like intended. Cmd+` of course will work but I do it in different way. I do the Cmd+tab when i do that, I dont release the Cmd so the opened apps are still visible. While it is visible, I will press ▼. This way it will show all your opened application with animated displayed so you can navigate using arrow keys. I figured out why cmd + ` doesn't work half the time. Your applications can not be in full screen mode, which is kinda silly but I tried it on the Finder window like mentioned above, no problem. Took both chrome windows out of full screen and the shortcut works like a charm. The best I could come up with is pressing control + left or right on your keypad. It cycles through all your full screen windows, but hey at least it's something. Also North American keyboard settings, though I don't think that actually matters since the issue, assuming at least, is the app was fullscreen. Command+` is the way to go on OS X to change between windows of the same application. The key combination to switch between app documents in the Spanish keyboard is Cmd+^`[ (the key next to the letter P, which is the actual backtick key in the Spanish keyboard and also prints the "^" and "[" symbols when used in conjunction with Shift and Alt respectively). Not the answer you're looking for? Browse other questions tagged macos keyboard google-chrome . How to change the default shortcut for “move focus to next window” to something else? 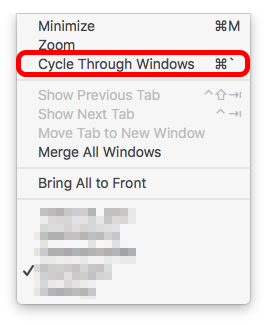 shortcut for cycling between different windows of Finder on Mac (not the tab)?